A US$ 6 million Adaptation Fund project is helping communities in Cuba that have been vulnerable to coastal flooding and sea level rise related to climate change recover protective marine ecosystems and forests. 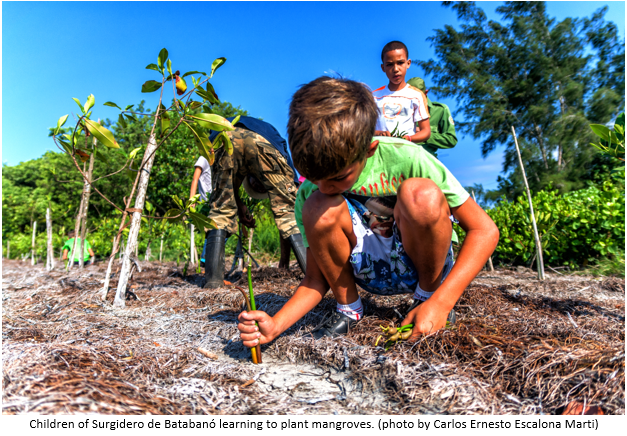 Through planting mangroves and fostering their natural regeneration, placing stake lines to reduce sea surges, cleaning canals and promoting coastal forest growth through education and sustainable activities, the project is making a positive difference in reducing vulnerabilities to climate change in the southern Provinces of Artemisa and Mayabeque on Cuba’s western Gulf of Batabanó. 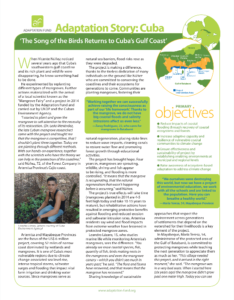 Entitled, “Reduction of Vulnerability to Coastal Flooding through Ecosystem-Based Adaptation in the South of Artemisa and Mayabeque Provinces,” the project is funded by the Adaptation Fund and implemented by the United Nations Development Programme (UNDP) together with the Cuban government’s Ministry of Science, Technology and Environment (CITMA) and Ministry of Agriculture (MINAGRI). “Look how many mangroves we have today. When you see the fauna recovering, it is because the flora has recuperated,” said Vicente Núñez, a forest worker for the project on Artemisa’s Cajio coast. Please see the full story here.